If you walked into my house unannounced, at any given time you’d find the same thing. Well, first you’d find a very uncomfortable look on my face because who comes over without calling or texting first?! But then you would notice the toys everywhere. I only have two kids, but with birthdays, Christmas and most weekly trips to Target, I find myself stuck with an overwhelming amount of toys. Enter the world of resale. The resale industry is gaining popularity and it can not only put cash in your pocket by selling items, but it could also save you a few bucks when shopping. Secondhand shopping has lost a lot of stigma that it used to hold and today, it is seen as a lasting trend. Parents are savvy and when something is good for your pocket and the environment, as is the resale industry, it’s a win. Most interest in toys is short-lived and buying gently used is almost always worth it. 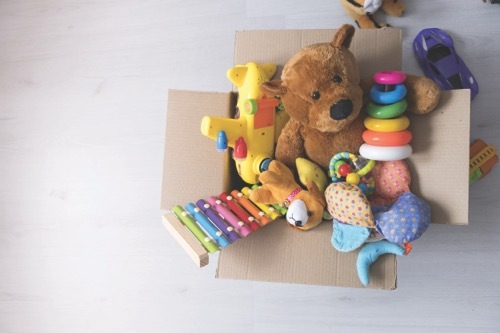 Stores such as Once Upon a Child offer cash on the spot for gently used clothing, shoes, toys and baby gear. All you have to do is bring your items to them and after a quick review, you’ll walk out with cash. There also are different events around the region where you can buy and sell children’s items. For example, Rhea Lana’s has pop-up shops where you can consign items or be a shopper. Also, check with your city or local PTO or PTA to see if they host a community garage sale where you can shop or purchase a table to sell your stuff. A few weeks before Christmas, I spent time in my basement going through toys that are no longer used. I found all the pieces to the play sets and arranged a photo shoot. After swatting away two toddlers who suddenly wanted to play with all of the previously unwanted toys, I took a few pics with my phone and uploaded them to my local Buy, Sell, Trade page on Facebook. Within 48 hours, I made $75 and got rid of significant clutter. I did spend the $75 on new toys for Christmas, but at least the old went out as the new came in. You can search Facebook for your local Buy, Sell, Trade site like I did — or even easier, use the Facebook Marketplace (the little storefront icon on the bottom of your Facebook app). The app will walk you through posting an item for sale once you click on it. Be aware of a few commonly used abbreviations to make sense of the site’s correspondence. PPU means “pending pick up,” or could also mean “porch pick up,” when the seller will place the item on their porch and the buyer is expected to pick it up and leave cash (typically under a doormat). Another option for exchange is to meet the buyer in a public place like a shopping center parking lot. A notice to PM someone indicates that they will send a “private message. NIL is a person who has commented with interest in an item, but is “next in line” because someone else has commented before them with interest. Be prepared, as a seller, to accept less than what you expect. For example, the retail value of a Blaze and the Monster Machines lot I sold was $70 and I ultimately accepted $20. Also, bundle like items for a bigger payout (i.e. a series of books by the same author or about the same topic will justify a higher price than a single book itself). Other online resale opportunities exist with companies like ThredUP, Poshmark, ebay and Craigslist. Professional marketer turned stay-at-home mom Reneé Sanden rarely ever stays home. She’s usually out and about with her two children, visiting kid-friendly spots and reporting back to the readers of C.A.L.M. in CLE. You can read more from her at calmincle.com or northeastohioparent.com/bloggers.